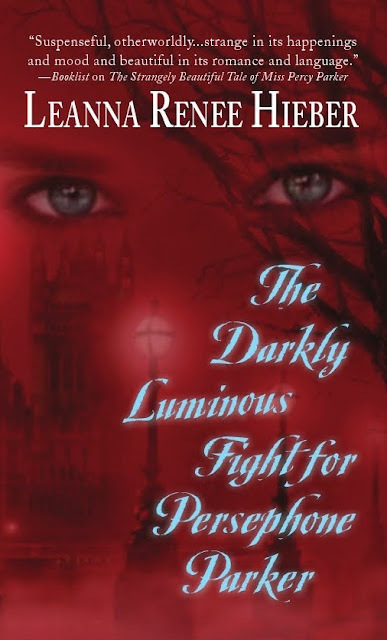 Babbling About Books had the exclusive unveiling of the cover for The Darkly Luminous Fight for Persephone Parker yesterday and it is now out in the world to share. This book is Leanna Hieber's follow-up to The Strangely Beautiful Tale of Miss Percy Parker which debuted earlier this year. The new book releases April 27, 2010. Something about the cover reminds me of a Christine Warren book cover. With radiant, snow white skin and hair, Percy Parker was a beacon for Fate. True love had found her, in the tempestuous form of Professor Alexi Rychman. But her mythic destiny was not complete. Accompanying the ghosts with which she alone could converse, new and terrifying omens loomed. A war was coming, a desperate ploy of a spectral host. Victorian London would be overrun. Yet, Percy kept faith. Within the mighty bastion of Athens Academy, alongside The Guard whose magic shielded mortals from the agents of the Underworld, she counted herself among friends. Wreathed in hallowed fire, they would stand together, no matter what dreams or nightmares—might come. Cool cover. What perfect choices of color. Thanks for posting this, Doug! I'm really thrilled with the cover and how it looks side by side with The Strangely Beautiful Tale of Miss Percy Parker. Thank you for spreading the word! I'll be unveiling the book trailer in December. Blessings! Interesting cover and I like how it's not totally different looking from the previous book. Sheila the two books make a nice set. Leanna another striking cover. Look forward to the trailer! Lady_tink its' always nice when cover designers choose a theme and stock with it. KMont I have no doubt a copy will be floating your way sometime soon. I still owe Leanna a review of the firs t book. Sigh.